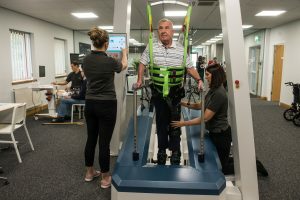 MOTIONrehab is the only centre in the UK that can offer walking rehabilitation with the THERA-Trainer LYRA robotic gait trainer. An individual’s ability to participate in their day to day activities is often reliant on their ability to walk. Regaining the ability to walk is one of the main goals for individuals after a stroke, head injury or spinal cord injury. For people living with MS, Parkinson’s disease or other related neurological condition, maintaining the ability to stay on their feet and keep their independence is also a great concern. The more problems people have with walking, the more devastating the consequences of their illness. MOTIONrehab can change this. The Lyra is based on the scientifically established principles that high repetition and specific gait training results in greater therapy outcomes with 20% more patients being able to walk compared to traditional therapy approaches. When using the LYRA an individual’s feet are held in place on mobile footplates. The movement of the footplates replicates natural walking patterns. This enables patients to make up to 40 times as many steps compared to treadmill training or manual walking practice. The LYRA provides body weight support which opens up the possibility of walking therapy for those people who are currently unable to walk or find walking difficult and can provide intensive training in a safe and effective environment. Whatever your ability the LYRA provides highly effective walking practice. It enables controlled cardiovascular training and strengthening of muscles needed for walking. Rehabilitation with MOTIONrehab and the LYRA will help any impaired individual to be gently guided back into daily life, step by step.